Silver Dolphin Books, 9781684123230, 128pp. Join Alice for an adventure in Wonderland! This classic illustrated collector’s edition of Lewis Carroll’s celebrated tale brings a new generation of young readers into the magic and madness of Wonderland. 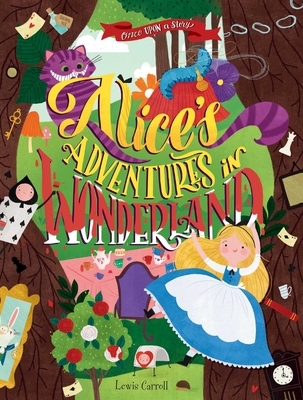 Once Upon a Story: Alice's Adventures in Wonderland features the classic story of Alice and her curious adventure in Wonderland with stunning color illustrations that bring the story to life. With a beautiful cloth cover with foil and a ribbon bookmark, this deluxe hardcover book is sure to be cherished time and again. Charles Lutwidge Dodgson (27 January 1832 – 14 January 1898), better known by the pseudonym Lewis Carroll, was an English author, mathematician, logician, Anglican deacon, and a photographer. His most famous writings are Alice's Adventures in Wonderland and its sequel Through the Looking-Glass, as well as the poems "The Hunting of the Snark" and "Jabberwocky," all examples of the genre of literary nonsense. He is noted for his facility at word play, logic, and fantasy. Born in Columbus in 1991, Lindsay Dale-Scott made her mark on the illustration industry after encouragement from both parents to pursue a creative career. While studying graphic design and illustration at Columbus College of Art and Design, she earned an award for her advertising campaign for the sloth sanctuary (she loves sloths!) of Costa Rica. She gained local, regional, and national recognition with the American Advertising Awards, "The Addy’s." Lindsay describes her work as whimsical with a soft, sophisticated touch, drawing inspiration from classic Disney artist Mary Blair. Vintage posters, folk and fairy tales, and things that are a bit quirky also inspire her. She currently resides in Cleveland with her husband, two bunnies Sam and Pepper, a teddy bear named Toby, and a long-haired Dachshund named Violet. She enjoys living outside the city but is always keen to make trips into the city and other towns for inspiration.